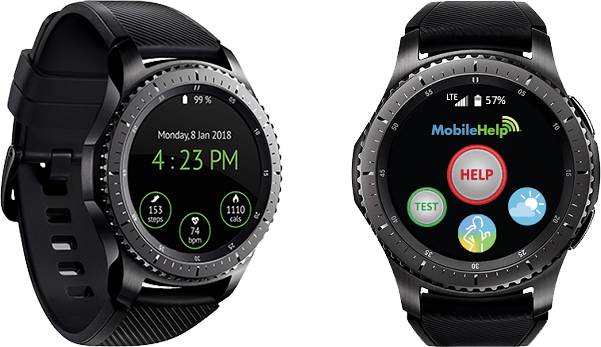 Can Two Titans of tech Deliver on the Promise of integrating the Samsung S3 SmartWatch with a MobileHelp medical alert System? That’s the question we’ve been asking ourselves at InHomeSafetyGuide.org since we first heard of the device earlier this year. We speculated if this was going to be a Samsung Gear with an advanced app or if it would require a cell phone or something else. What we did know is that both MobileHelp and Samsung were bullish on the device and both companies have reputations for technology advancements that aren’t just incremental, but leap-frog the competition – the kind of advancements that truly better our lives that we haven’t seen before. How would that play out with the MobileHelp Smart? InHome’s Co-Founder John Clinton received the device in April and the questions we had were answered. This is the one device that quite simply changes everything. 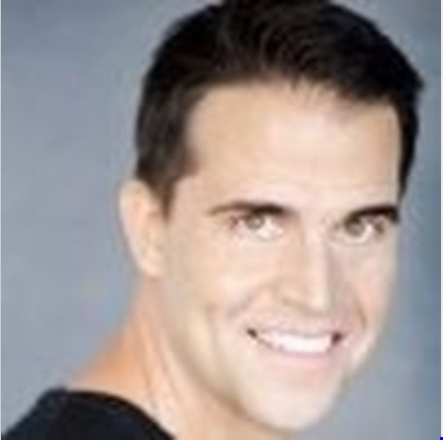 Since starting InHomeSafetyGuide.org back in 2012 with our co-founder, Kane Wilkin, the process of Reviewing & Ranking the Best Medical Alert Systems each year has been fairly straight-forward. However, that changed the day we received the MobileHelp Smart. Simply put, this device is a game-changer. 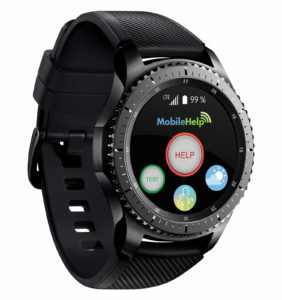 The MobileHelp Smart is a full-featured, GPS-enabled, medical alert system that has effectively been encased in a Samsung Gear SmartWatch. To be clear, this is not the Samsung Gear SmartWatch with some advanced app running in the background. No, it is a medical alert system first and foremost, and an advanced one at that. With a built-in microphone and speaker for push-button help, GPS-enabled location services, and even sensors to monitor one’s vitals, it’s incredibly powerful. There is no smartphone required, the watch is it. Historically, the medical alert industry has been defined by a campy catchphrase that used fear to market a product. Unfortunately, that fear also created a stigma, that wearing a medical alert system meant you were old. It’s an image that companies like MobileHelp and others have helped to combat in recent years, by offering systems and services to aging adults that empowered them to get the most out of life. The arrival of this MobileHelp Smart is not just an advancement in technology, or some styling changes to make medical alert systems a bit more fashionable. This device takes the perception of using a medical alert system as being old, weak, and punches it in the mouth. And it’s about time. Makes it easy for anyone wearing the watch to get help in an emergency situation. Your personal data is safe with Samsung Knox, Samsung’s defense-grade mobile security platform. MobileHelp Smart GPS technology gives users the peace of mind that they can summon help 24 hours a day. Trained operators receive know who the user is, where they are located, and provide the right level of response. By leveraging Samsung Health, users can track heart rate, sleep, steps, and other activities. MobileHelp has collaborated with Samsung to design a groundbreaking product that utilizes smarter technology solutions, emergency response functionality and digital health capabilities to help solve a range of modern issues – from helping seniors live longer and more independently to workers and athletes being safer on the job or at play.